The MX500 1TB SSD was tested on the Intel Skylake-X rig which contains the i9-7900X processor, ASRock X299E-ITX/AC motherboard and 4x8GB Ballistix Sport LT DDR4-2666@4000 RAM. Used operating system is Win10 Pro x64 installed on the Crucial BX300 SSD. 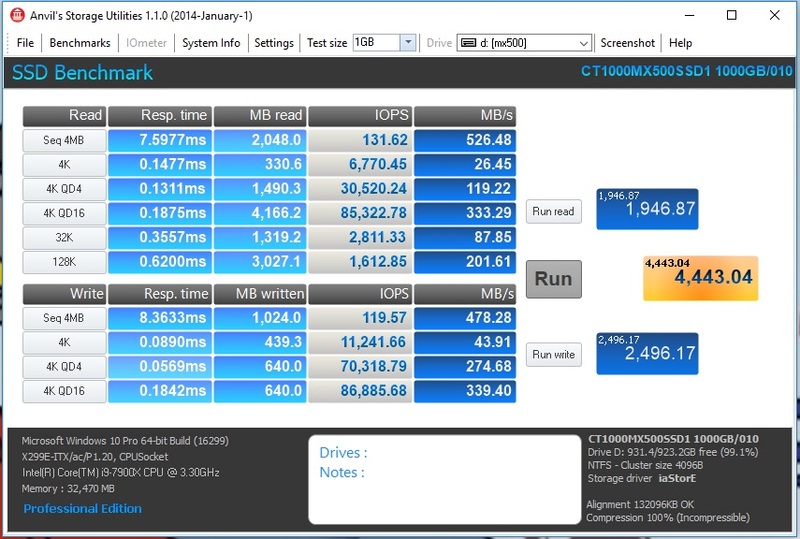 Performance is really important and it’s actually one of the main reasons why users pick SSD. The MX500 is not meant to break storage world records. However, when we take a look at the SATA SSD market then it looks really good. Just check our results. ATTO is showing sequential bandwidth about as high as that declared by Crucial. There is some drop in read bandwidth and I’m not sure why it’s happening. I guess it will be fixed in firmware updates. On the other hand not the sequential bandwidth is the most important but random performance on which most our programs base. CrystalDiskMark is showing us both, sequential and random operations but it’s focusing more on random bandwidth. 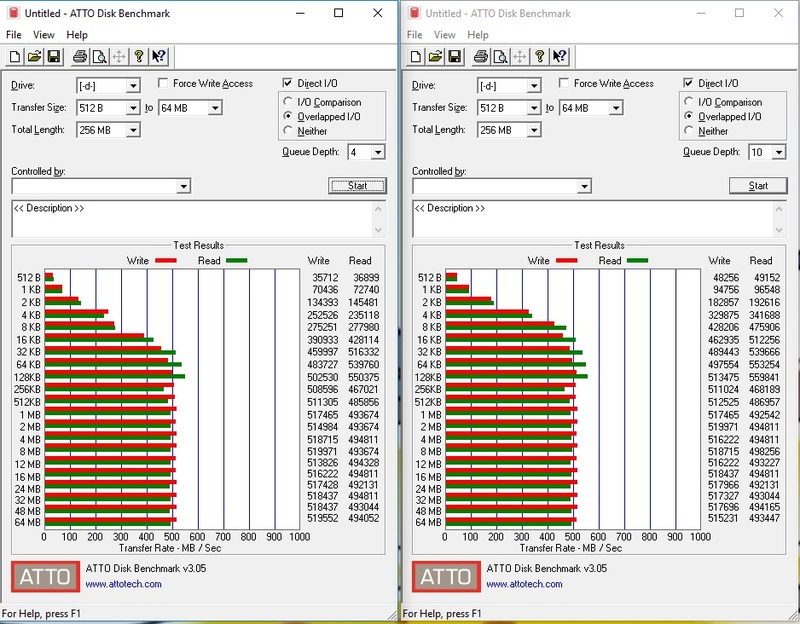 If you compare at least 4KiB Q1T1 to the competitive drives then you will see that barely any other SATA SSD can get close to the MX500 results. Most SATA SSD can’t make much above 30MB/s random 4K Q1 read and only top series reach 40MB/s. Here we see 46MB/s and every couple of runs even 47MB/s. These are results of lower series NVMe SSD! Anvil’s benchmark as usual is showing lower results. Since manufacturer is never telling us what will be constant bandwidth but maximum then we can’t really complain. Results are still good and as I mentioned, I guess they will go up once new firmware will be released. I wanted to run PCMark 10 test but Futuremark has not added storage benchmarks yet and all current results regardless of used SSD are about the same. In this case let’s take a look at the MX500 results with enabled Momentum Cache ( available in Crucial Storage Executive software ). If you can’t afford expensive NVMe SSD but still wish higher performance then why not to use additional caching of your Crucial drive ? Results are great and may speed-up your daily work for free. It’s recommended to have some more RAM to support this feature but most modern computers already have enough RAM so I don’t think it’s an issue. 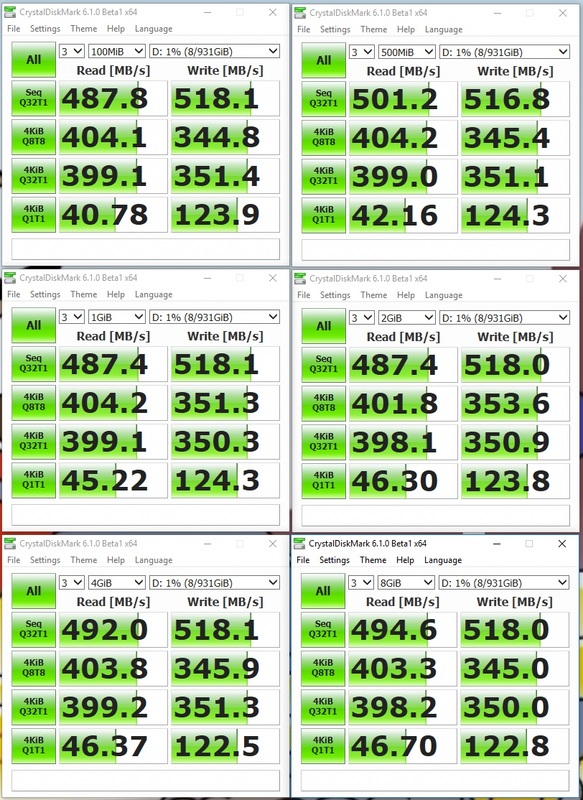 The MX500 SSD is performing better than I was expecting. Especially random operations look great and it’s the key to SSD performance. What more, the MX500 is one of the cheaper SSD on the market so it’s hard to find any competition if you are looking for SATA SSD. 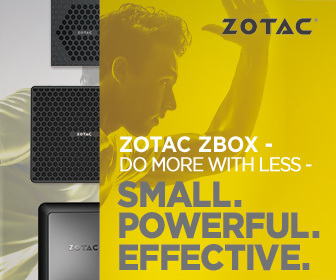 I guess that all who are looking for inexpensive but higher capacity SSD will be fully satisfied of the MX500 series.